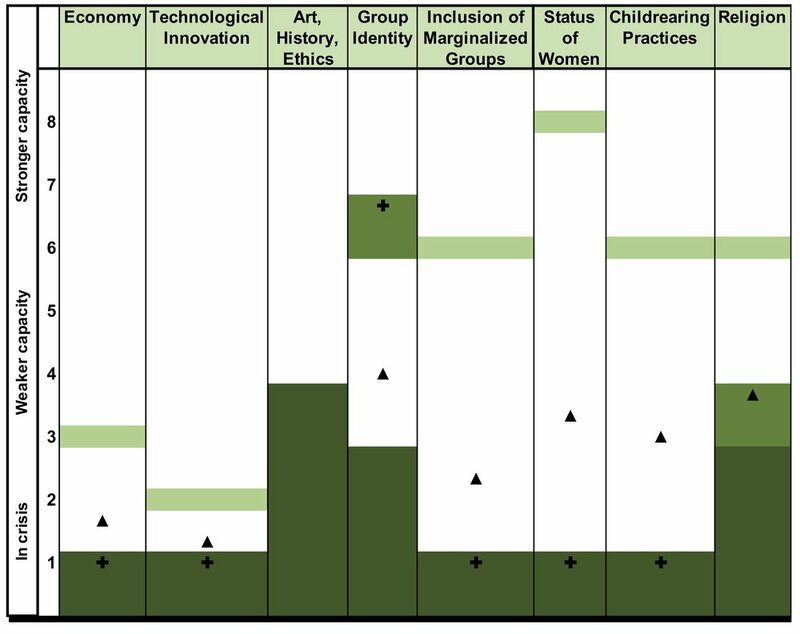 Syria's Economic and Cultural Capacity is one part of INCA, the Inclusive Nationalism Capacity Assessment. INCA is a tool which 25 influential organizations have used to assess Syria over 3 rounds and 18 months. These organizations are local, regional, and international, and rated by their peers as among the 100 most influential organization engaged in the life of the country. We refer to these organizations as "prime actors." INCA is comprehensive, developmental, and easy to use. It provides a common vocabulary that allows individuals and organizations from different countries, and different parts of society, to share and learn about and from each other, to negotiate and cooperate more effectively. This part of INCA measures Syria's ability to adapt economically and culturally to threats and opportunities, along 8 dimensions listed on the x-axis at the top of the graph. INCA allows users to measure capacity. Each higher level represent an increase in the ability of the country to govern itself. Note the 8 levels of the y-axis.